My mantra: I’m okay today. Listen you guys, it’s been a challenging few weeks behind the scenes of my glorious life. Everything’s fine, don’t worry. But for six weeks I’ve been scanned, biopsied, probed, propofol-ed 2X, hospitalized for a few hours for a surgical procedure which was accompanied by a long uneasy recovery, put on new medications, and seen by new doctors. It’s been a bit of a medical uproar. It was like a scavenger hunt trying to find out what was going on (hence all the testing). The “prize” at the end of the hunt was learning that I had a very rare disease caused by past treatment for breast cancer. She gave me the names of three key players and my nursing friend, Joan, researched all of them and concluded, “You’re going to UCSF and seeing Mark.” I was happy with that. Of all three people my doctor had talked about in her office, his name was the one I had starred. Joan would drive me and be an extra set of eyes and ears. All I had to do was figure out what to wear to the second opinion appointment. I take these kind of appointments very seriously. I had a few goals for my outfit. Given I had never met this doctor before I wanted him to get a sense of who I am. I wanted him to see a healthy, vibrant, resilient person. Bright, aware, and planning to be here a long, long time. I wanted to dress in a way that showed I respected him, his time, and his broad knowledge. I wanted to put together an outfit that brought comfort to me. It could be interesting but not at all busy or visually loud. I wanted to wear personal symbols, symbols that ground me. I wanted to be comfortable, to wear something that didn’t make me have to think about my clothes. I wanted my full attention on Dr. Mark and what he had to say. The pants: I knew I wasn’t going to go casual and wear jeans even though I’m sure he has plenty of patients who do. 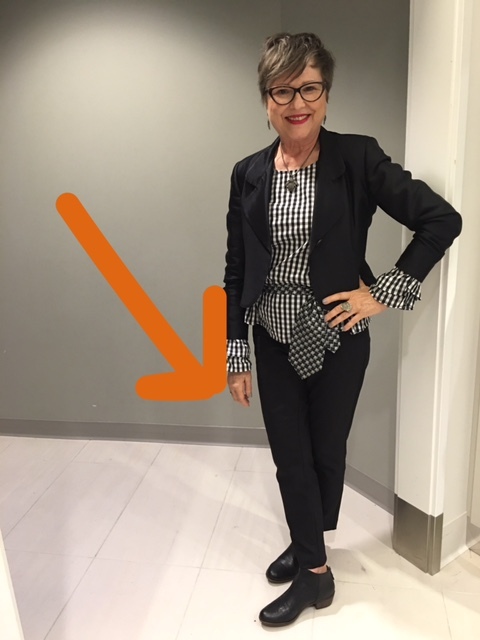 I wore my Lafayette 148 black ankle pants that are super comfortable and easy to not pay attention to; all the better to pay attention to the doctor. The shirt: I decided a white blouse would be respectful. No T-shirts for me. I wore this white blouse by Hugo Boss. I love the way it feels and I enjoy the detailing on the front. The jacket: I debated about wearing a black jacket with my white shirt and black pants but in the end, I wanted my jacket to comfort me. 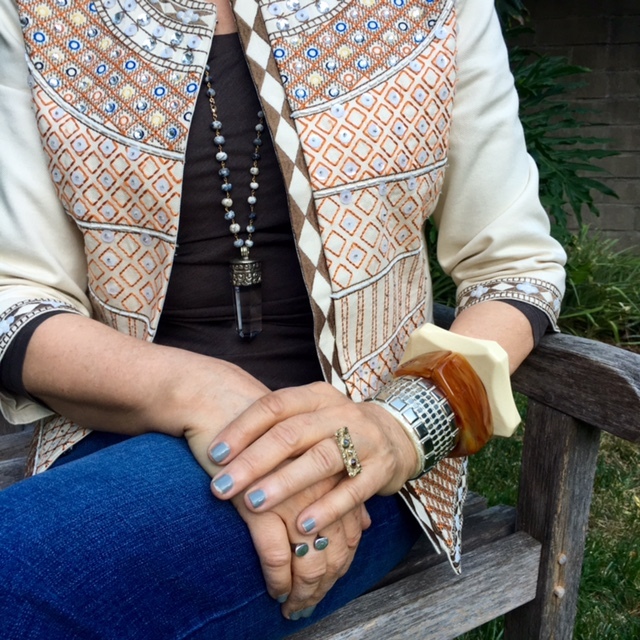 Nothing makes me feel more secure and cocooned than this Dries Van Noten jacket that I picked up at a consignment store in Santa Fe this summer. The print makes me think of plants and water and the blue sky. I feel comforted always by Nature. Wearing this jacket was like wearing serenity. 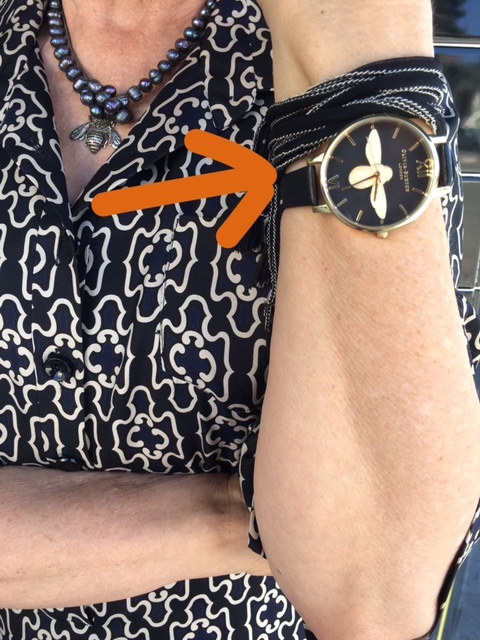 We’ve talked about wearing symbols and of course, I had to bring out my bees. In the 23rd Psalm it says, “Even though I walk through the shadow of death, I will fear no evil. For you are with me; your rod and your staff, they comfort me.” I can’t quite get the symbolism of the rod and the staff but I do get the symbolism of bees. They comfort me! 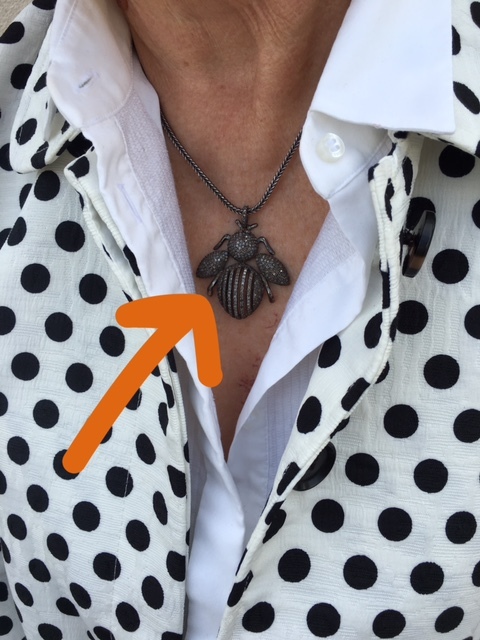 I talked about wearing symbols in a recent blog (catch it here). Bees symbolize the idea that anything is possible [like great health]; they symbolize feminine power [having the power to face whatever I have to face]; they symbolize community, brightness, and personal power [my great health care community that includes doctors, nurses, family and friends and the brightness of a great future!]. 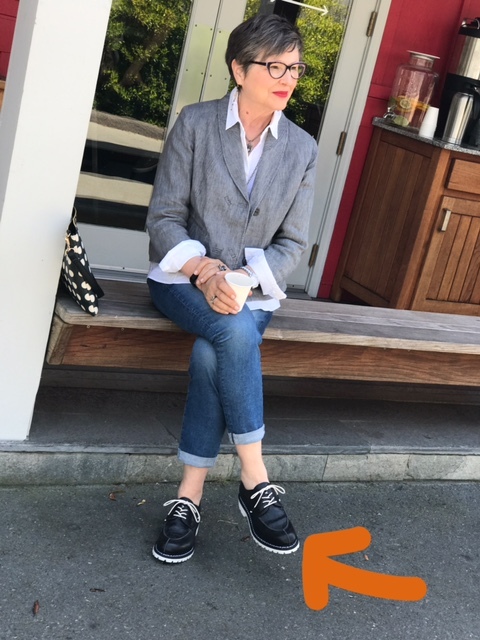 Shoes: I wanted to feel grounded and sturdy so I wore my laced Rosa Mosa oxfords. “Oh, I love your necklace! What is that?” she said after she found my name in the computer. “Oh, no, they can be very beautiful.” And then he goes on about moths he’s seen. Next, he’s pulling up an image of a moth on his computer to show me how beautiful they are. “Wow, that looks like a shawl, not a moth,” I said about the giant moth with the incredible pattern on its wings. In my mind I’m thinking, Way to go, outfit. You’re instigating conversations. You’re breaking the ice and making me not feel nervous! Joan and I were having a blast with these two people and we hadn’t even gotten in to see the doctor yet! Then I was called into this hallway to meet someone else. He was taking care of the weighing and measuring and blood pressuring and listing of medications. Maybe you had to have been there but gosh, he seemed as familiar with medical terms as I am with car mechanics. When he took us to the doctor’s office and told us the doctor would be there soon, Joan looked at me and said, “Where did he come from?” We got the giggles. I mean the snot-coming-out-of-the-nose kind of giggles. Then the doctor came in and asked me to sit next to him. It was an enlightening forty-minute chat. Joan and I passed on his report just minutes later when we joined my daughter Caitlin at b. patisserie right after the appointment (the grown up equivalent to a lollypop). As we told Caitlin Dr. Mark downgraded my condition from “very rare disease” to “fairly common” disease. I learned that my fairly common disease will not likely progress (fingers crossed). In fact, it could even get better. It won’t be cured but the goal is to continue to treat the symptoms. I’d been dragging my feet about another endoscopy (Do I have to????) but now I am totally on board. He’s an expert on the type of breast cancer I have. I had a recurrence several years ago but I’ve been stable for a long time. If it were to flair up again, he told me about the new things that are happening in the field. I’m not in need of any of those right now but it was great to hear about cutting edge treatment options. Maybe I really can be here for a long, long, long time. I’ve replayed it over and over myself. I find myself settling down and settling into my body, the same body that had me baffled and scared for weeks. Like I told Caitlin, I feel like this is the first day of the rest of my life. Will you all do me a favor? Will you exhale with me? I love this community that’s formed on the blog. You’re all so kind. I feel buoyed by your presence in my life. Life is good. Life is sweet. Let’s all carry on. Can clothing choices be influenced by childhood? I know the utter relief and joy of a good report. I am so very happy for you. Two years ago I was diagnosed with borderline ovarian cancer. I am now on 6 monthly checks. All is great so far. The diagnosis changed my life forever, in a good way. Boy, I bet we’d have a lot to talk about if we sat down for tea! I am very happy for you that all is well. Blessings are coming your way from me! Love your optimism and the positive nature of your post! You look fab! Eep…in my enthusiasm I hit enter too soon. Your looking fabulous is not just your clothes and your accessories. You always have a joyful energy resonating in your photos! I can see that your inner light shines bright! That would certainly be my wish, Sue. I appreciate you saying that. Thank you, Sue. It’s great to hear that from you! Being so positive is great for your health. I have a feeling you certainly will be around for a long long time. I like your feeling! Thanks! Brenda, I’m exhaling with you. Here we are still exhaling after this past Monday’s visit with hubby’s oncologist to debrief his latest biopsy. I’ll spare you the details, but after everything he has been through in the last three years, this was one of those “Would you like milk chocolate or dark chocolate with that?” outcomes. And, yes, I go through the mental machinations as you when dressing for doctor appointments, whether mine or hubby’s. Those are VERY important meetings. And we dress for success, eh? You have certainly taking the term “Dress for Success” and flipped it to where it needs to be! YES, a triple yes! I’m so happy to be exhaling with you and your husband. Somehow, I feel like we’re all in this together. Big hugs to you both! Thanks, Kathy. You described the battle zone so very well. Yes, we do have to prepare. It’s the only think we have control over, right? We can’t control the outcome. Sorry to disappoint! 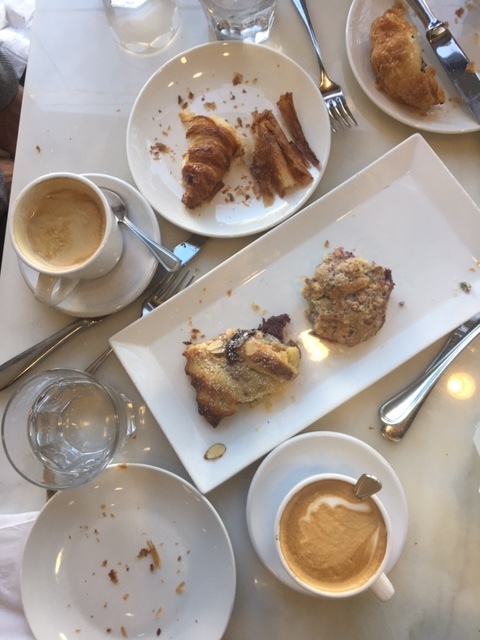 Those pastries were shared with three people–my daughter Caitlin, my friend Joan, and me. We enjoyed every morsel. In fact, twice as much! When I saw the start of your blog, my heart clenched. You had to be OK, that is all that matters. You have hidden it from all of us very well. All of our prayers and hopes go to you that you carry on for many more years. On the lighter side, your outer shell was silmply gorgeous, and the one at the beginning is ‘comforting’ to look at. You are amazing. Having fun with outfits is always a great pick me up when not feeling the best and you are a master. Oh, and that plate of yummies was the perfect celebration. Hugs to you Brenda. Thanks, Diane. I feel like you were there with me even though you didn’t know yet! It’s not really that I have hidden anything. I just don’t talk about it or spend a lot of time identifying with that part of what goes on in my life. I identify with love of family and community and enjoying beauty and creating beauty. That’s what life is all about for me. I’m blessed to be able to do what I love and hopefully, will continue for a long, long time. Thank you for your support! oh my goodness, a million miles away, I am definitely exhaling with you. I have tears in my eyes Brenda, reading about your very scary upheaval over the last weeks, (years ) I have been priveleged both professionally as a nurse, and personally as a friend and previous partner , to witness the courage and integrity that people such as yourself, deal with this crazy rollercoaster ride of cancer. Like those others, you are a true warrior, in this thing called life. What amazes me, in the small time I have connected with you and your community,is that despite all of this going on behind the scenes, you were still available and present to all of us, and no doubt, countless others. Now it is time for you! Go hug a chook, eat more pastries, find that nature, and give love to you. I hope this is not too forward, of me to say. Anyway, Hoorah !!!! and i am reminded so clearly, of a poem that my Dad always said when I was a kid,, and sorry, I dont know the author. I so appreciate your words, Trinnie! Yes, it sure is a roller coaster. My work with my clients and my writing is what makes me happy. 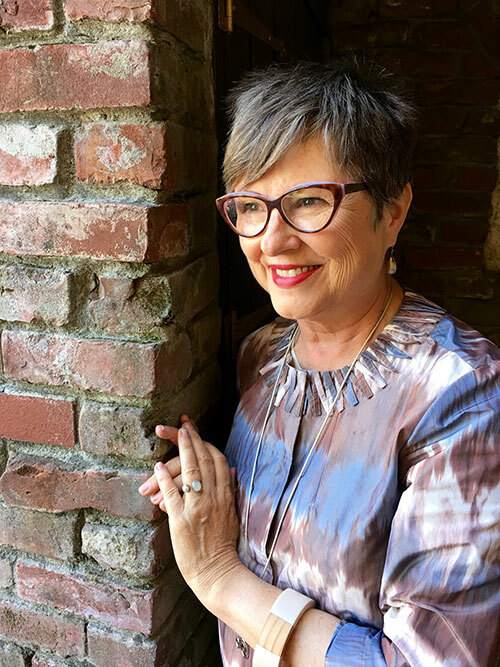 When I was having a difficult time recovering from the surgical procedure I was saying in my head, “I just want to go work with my clients and make them beautiful.” So know that writing was helping me immeasurably. Thank you very much for the clear message to spend time nurturing myself. Isn’t this a message we all need to heed? Thanks dear from from Oz. Big exhale here with you in Austin, TX! I love the metaphors of your outfit and can relate to all you describe about the comfort they provide. Thank you for sharing, you’ve enriched my thinking today and always! So happy to hear this, Djo! Beautiful post – the content, the photos, the result. Thanks, Robbie. Glad you were there to read it! You are so positive and upbeat! I’m exhaling with you! Reading this made me do a deep exhale. Thanks for exhaling with me, Maggie! So glad to know that all is well! Thank you do much for sharing yourself with us so generously, Brenda. You’re a gem. Thanks, Bev. Your words are much appreciated! Thanks, Amy! From your lips to God’s ears. Love you! I got very nervous for you, Brenda, when I started to read the blog. I am so, so glad for you that the news was good. So many of us want your amazing writing and vibrant personality around for a long time. Sending a huge hug from Fargo from me to you. Hope you can feel the warmth and squeeze from it. Continuing my prayers for you as always and so thankful for this news. Can you remind me of the saying you liked so much and I think you had it on a cup or something last time we saw you in ND? Something about living in the moment? It’s funny, Marsha, the only cup that comes to my mind is one that says Uff Da!!! Maybe Keep Calm and Carry On? Thanks always for your prayers, dear Cousin. That was it! Keep Calm and Carry On. Thanks. Altho Uff Da is good too! 🙂 We are keeping a close eye on the news lately and praying that you and yours will be safe. Such tragedy, hard to imagine. Thank you for sharing you with us. Health worries can stop us from being in our happy places. Wishing you blessings for the rest of this journey! I happily accept those blessings you’re sending my way! Thanks, Barbara! I’m so happy!! So glad it turned out okay! Sending hugs and love your way! Thanks CherCher! Love to you! Hugs to you. I am so glad that everything turned out fine and you have inspired me to think more carefully about my outfits in the future. Maybe I’ll adopt a personal symbol…..
You never know when you need a personal symbol. Why not? I support you! Oh, Brenda, I had no idea. First of all, and most importantly, I am so glad about the results. I, too, want you around for a long long time. Secondly, I so understand about dressing for the doctor. I find that I wanted to be treated with respect and dignity as a patient, I want to be remembered by the staff, and that the combination of appearance AND communication makes all the difference in the world. I learned from my more extroverted husband that actually introducing yourself to staff helps so much, whether at a doctor, a restaurant, or at an airplane gate. What great advice that is! About introducing yourself to staff. Everything you said about how you want to be treated and remembered is true for when we are seeking care and it’s really important I’ve found for when you are the advocate for the person getting care. When Mother was in the hospital, I dressed every day to be noticed, remembered, and respected. I wanted to be the strongest advocate I could for my mother who couldn’t do it for herself. I truly believe it makes a huge difference. Thanks, Lisa! All of the above lovely notes express my concerns, admiration and best wishes for you eloquently indeed. You are a shining example of female grace and empowerment. I am exhaling with you and for you too. I particularly love your arming yourself with your personal symbols as I do with mine in stressful times. (butterflies for transformation, crystals for their earth energy, ancestral talismans, etc.) . May you be blessed always. Penelope, I love hearing about your personal symbols. We need everything we can to get through certain times in life. Thank you for your kind wishes! I’m so relieved to hear that everything turned out OK! It’s true, what we wear can impact our emotional and mental states. Yes, it really can. Thanks, Susan! Oh, I love a happy ending! I do dress carefully for important appointments, but I’ve never put as much thought into it as you shared. I’m more apt to pair black pants with a black and white top, but love your description of choosing the special jacket instead. I’ve learned a lot from you! (I also loved your cute Chico’s jacket so much I bought one for myself. Divine.) I’m so pleased you’ve gotten good health news, and had such a memorable day. Thanks, Teri. I truly feel blessed. 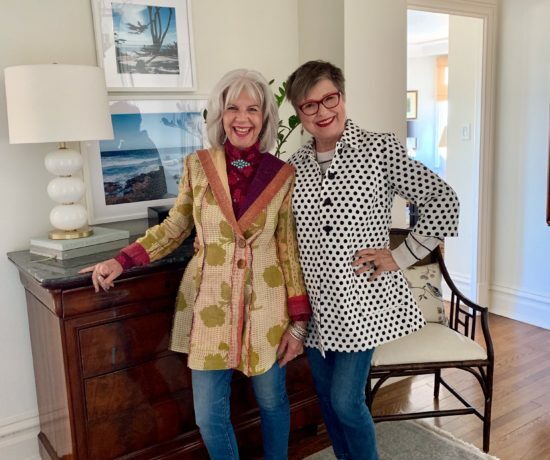 I so enjoy wearing that jacket and it’s fun to know someone else I know is wearing it too! Thank you Mary Ann. I feel your caring thoughts! Waiting for medical results is a trial. I’m glad that your second opinion was worth the visit. I have an outrageous skull ring, by Alexander McQueen, that I wear when I want some armor. By the way, the poem quoted by another subscriber is “Stopping by Woods on a Snowy Evening” by Robert Frost. I kept a copy in my classroom to read to my students on the first day snow fell in Connecticut. Thanks for naming the poem. Mom used to read that to us! And that ring! I think I know exactly what it looks like. One of my clients has one. I love using it in outfits for her! That’s a good piece of armor! You are truly an inspiration to us all! Thanks, Cindi! You know how in health care now they have targeted drugs. Your comment about courage and comfort is like a targeted outfit meant to support exactly the situation we find ourselves in. Thanks for your wishes! I too know that feeling of holding your breath during those bumps in life that occur when you are a cancer survivors. Your positive attitude is amazing. 12 years after my diagnosis, surgery and treatment for lung cancer I still get that flutter of the heart and tensing when something seems out of the ordinary. 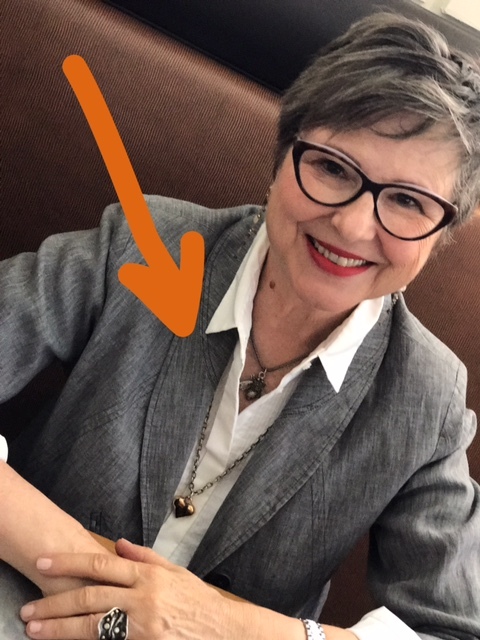 My armor is a crisp white shirt, black cropped pants, ballet flats, a smart handbag and my bling (vintage Cartier watch, diamond studs and a gold bangle,). I am ready for battle, and that feeling when you realize there will be no battle and you can breathe again! Must be the upper Midwest in me (Minnesota). Great news for you! Nancy, you explain this so perfectly. I was right there with you. Yes, this is part of what we have to expect being cancer survivors. You’re right on about being prepared for battle and then recovering, breath by breath. A shout out to Minnesota! And love the image of your warrior outfit. Brenda, I’m so sorry you had to go through so much stress, and so relieved that one of my very favorite bloggers can continue with her inspiring work! I recently went through a similar experience with endless medical tests, and got the final results yesterday (thankfully nothing seems to be wrong with my heart or lungs). I went through a similar, but not as well informed experience in deciding what to wear to the doctor. It’s amazing how clothes can fortify us. I’m so glad your news was good, even if not perfect, and look forward to many more wonderful posts. That’s kind of the measurement of quality of life for me. If I can work with my clients in their closets or on shopping trips, I’m feeling so blessed and in my happy place. 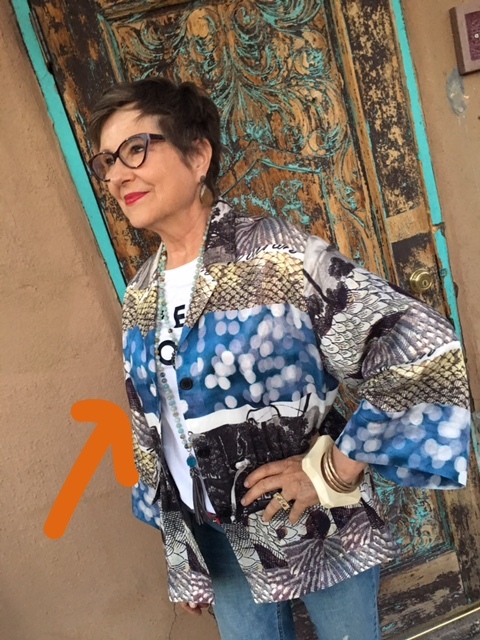 If I can come home and blog about fashion and style and being this age, I am so very happy. So yes, expect more posts from me, my friend! I’m blessed to be in my happy place! Thanks for your support. Even though we’ve never met, I always read your blog like I’m talking with a friend! You are such a courageous lady! I’m so happy that the results are positive and encouraging. 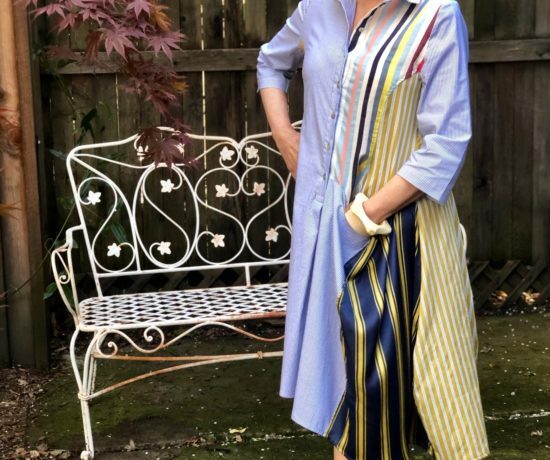 it’s so interesting that our clothes help us to “feel”, I’ve thought that too – I do choose things to wear that sometimes shield or hug or whatever I’m needing at times. Thank you for being so open with us all , know you have a so many people supporting you with prayers and encouragement – here’s a gentle hug ! I’m feeling that gentle hug right now! I love how you too have that understanding of how clothes can help us. And always, I appreciate prayers and encouragement. I feel blessed! So glad you received good news! What a reminder to squeeze every ounce of joy we can out of life. Boy, isn’t that the truth! 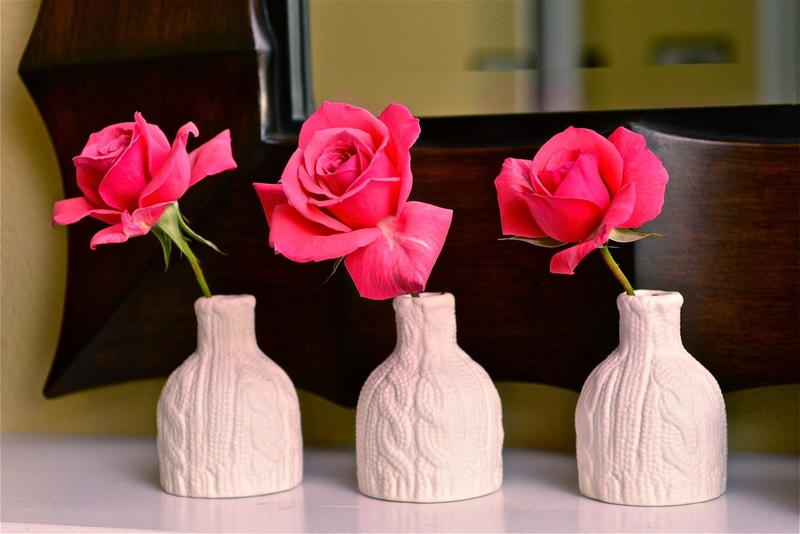 Exhaling with you – so glad you had good news! You look lovely, as always. I love the details of your surgery outfit! I can see that cat purring on your stomach keeping you calm. I wish for you a speedy recovery. I bet you were cute, gauze and all! Glad all is well. There is nothing like finding out what’s wrong and that it’s not fatal! I think that your outfit was perfect. It empowered you . That jacket is spectacular and the outfit says who you are perfectly. I have to say that a great outfit makes me feel empowered as well. Hooray to empowered outfits and all they can do for us. Sometimes it’s easy to worry that every little twitch or ache is fatal. I love that you used that word. It puts things into perspective. No, nothing in my path is fatal. Thanks for writing! Brenda, this post was so timely because of similar issues I’ve been going through. And like you, I needed to dress a certain way for my doctor’s appointment and wear a certain necklace that comforted me. So sending all good thoughts to you. I keep coming back to your blog for your sweet smiling face and beautiful optimism. Francoise, I am honored to hear that this is timely. I wish you the best in whatever it is you’re facing. We can do this together! Brenda, you are the light, my friend! Inspiring in so many ways: style, strength, resilience, inner beauty, compassion for yourself and others! Love you! Exhaling with you! Thank you, my friend Bess! I’m picturing you in my mind and we’re exhaling together! Thank you for this story of vulnerability and bravery. Thank you for being a reader. It makes it worth the scariness of pressing “publish” when I have butterflies in my stomach! I want to thank you for your bravery, honesty, humor, and the way you choose to deal with adversity in its various forms. I love how you find pleasure in the simple yet creative expression of fashion and make it a real goal any of us mere mortals can strive for. And yes, I sincerely do hope you will be here for a long, long, long time! Theresa, thank YOU! I’m smiling at your reference to “mere mortals”. It’s my pleasure to share my creative expression! You are (as Bess writes so elegantly) the Light. Your courage, humor, insights and love for Life, Beauty, Family and your Community–shine forth. I did hold my breath while learning of your bumpy path. Dear one, please know that you are loved. Your generosity and grace are deeply appreciated. Ah…exhaling with you. May all your guides, helpers and play companions be bathed in your light. So bright and inviting. Thank you Bees for showing you…how to be(e). Reading your comment, I feel soothed and calm. Thank you ever so much, Katherine, for your terrific observations and the way you articulate the love you carry in your heart! Brenda! What a brave girl you are! Thank you for sharing such a personal story. You are helping more people than you know and looking fabulous while doing it! Thanks, Kimberly. I appreciate the encouragement and kind words. Sending you beams of sunlight and love. And I’m bathing in them right now! You are such a positive person, even in the face of the unknown. I, too, believe that you dress for the “occasion”—even if it is confronting scary situations/news. You came through looking great! Power to you!! Thanks, Sue. It’s so nice to be understood! You get it! Whenever I’m in a crises or a difficult situation, my outfit choices matter all the more. Glad to hear you understand that too! I have gone through my own bout with breast cancer this past year. My thoughts and prayers are with you. You are an inspiration. Oh what a wonderful attitude you have… Praise God for the second opinion and it’s outcome. 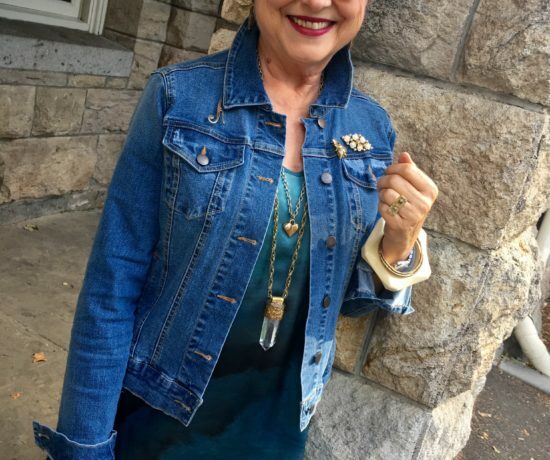 Now the outfit… Such a good choice and I too love that certain pieces instil is with confidence and courage. 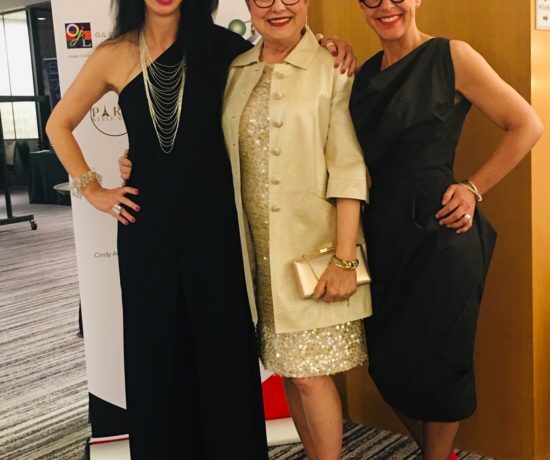 My clothes and lipstick definitely helped me as did a positive attitude.I felt strengthened from the inside by my clothes,if that makes sesnse! Wonderful news! Very strong exhale from the DC metro area–maybe even strong enough to make the prevailing winds in the US run from east to west today!! You were awfully strong to keep your postings so cheerful and upbeat in the midst of so much worry. The 23rd Psalm is my particular favorite, so here goes with the interpretation of rod and staff being a comfort. The rod was the stick a good shepherd used to count the sheep, making sure that if any sheep strayed it could be searched for quickly and not fall into harm’s way. The stick was also used as a weapon to keep the sheep safe from predators. The staff was like a walking stick, helping the shepherd to keep his footing steady so he could lead the sheep confidently and navigate difficult or even dangerous terrain to help and rescue any sheep that was lost. The psalmist is saying that he can be at peace, knowing his shepherd has all the knowledge, skills. and tools needed to keep him safe. Sounds a lot like you have the “good shepherd” of medical teams, Brenda. I’m so glad you’re okay Brenda! Your doctor sounds very good. Your nursing friend picked well and your doctor sounds to have been all over every aspect of your care and was also able to support you to share in his views and knowledge. There’s something to be said for a committed and talented and kind professional isn’t there. They are really the pinnacle of what we humans achieve. 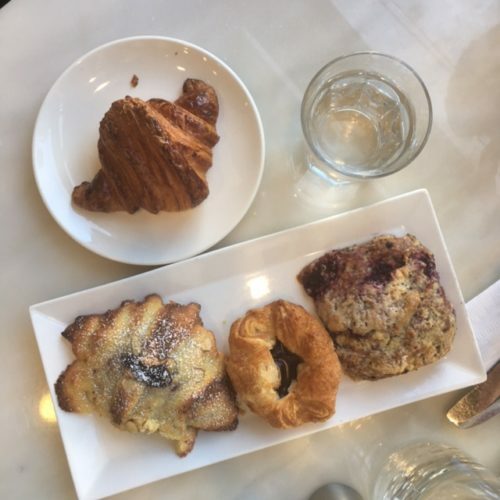 The before and after pastry photos are very nice, and I’m imagining the warm and relieved conversations had over those pastries and coffees. Weirdly my paper take away coffee at work yesterday had beautiful bees printed on it! Thank you for sharing this. You are an inspiration to me. Exhaling with you Brenda! Please hang in there and stick around for years to come, because we all love you so much. All your bees are buzzing with joy and relief. G R E A T NEWS!!!!!!!!! CLOTHING and ACCESSORIES OPEN MANY DOORS as YOU well know! I too, am so grateful that you’ll be here for a long, long, long, time. 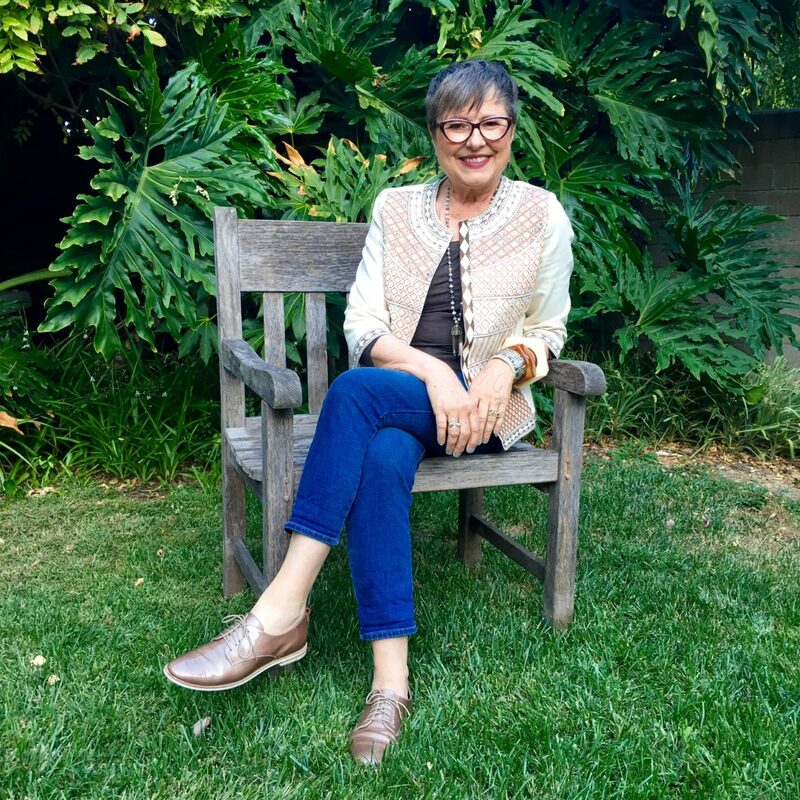 I LOVE reading your posts and you are my #1 wardrobe inspiration. Grabbing a virtual cup of tea with you and exhaling…………. Oh Brenda, what a scare and what utter relief you and your loved ones must feel. I know I feel relieved at the positive outcome for you. I just found you this summer and I feel like you are my sister from another Mother. So, so relieved you got a good report and rejoicing that you found a doctor with answers and concern for you. Giddy over the awesome sweetness of life. My husband is going through some extra medical issues this year and we have finally found a good doctor that we both love. Our second time to his office we dressed casual. He wears roughout boots and jeans and these two farm kids could feel right at home. Worried about you because of the fires. Let us know you are okay. Brenda, hope you and yours are safe…praying for all of you.